Today only, you can get a one year subscription to Family Handyman magazine for only $4.99 per year when you use coupon code MONEYSAVING at checkout. You can order up to four years at this price. About The Family Handyman magazine: Family Handyman magazine is for people who take an active interest in home improvement, yard and garden care, maintenance and repair, and remodeling. Family Handyman also features information on woodworking, auto maintenance, energy efficiency, and decorating. This offer expires tonight 03/25/13 11:59 PM EST. Thanks so much for the code! My husband’s subscription was about to end, and I was able to renew for 4 years for what I generally have paid for 1! 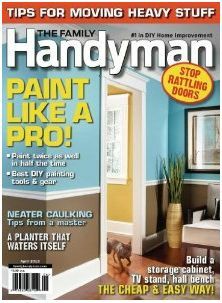 It’s an excellent magazine–we’ve both found a ton of great tips and info in it (we’re DIYers :-)).